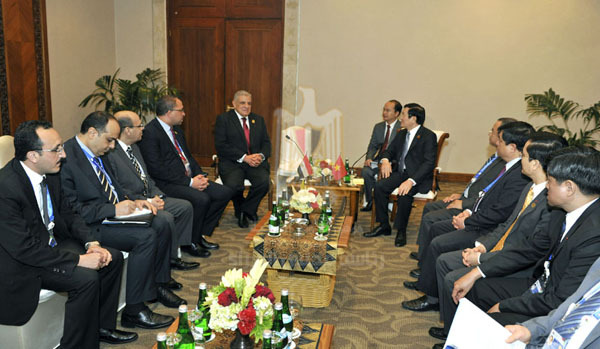 The State Information Service (SIS) hailed Prime Minister Ibrahim Mehleb’s visit to Indonesia Sunday as “a message that Egypt has made a strong return to its natural and central role in the world”. The SIS mentioned Egypt’s historical role in the creation of the liberation movements as well as the Non-Aligned Movement. Mehleb’s visit to Indonesia comes as part of the Asian African Conference, which is being held in the Indonesia capital Jakarta, and commemorates the first conference 60 years ago. Mehleb himself emphasised economic partnerships, especially concerning the “development and investment in the new national projects”. He also expressed Egypt’s desire to be “a strategic partner for these countries [the participants of the summit] in the future”. However, in a letter read out to the summit by Mehleb, President Abdel Fattah Al-Sisi highlighted the importance of the fight against terrorism. In turn, Al-Sisi stated it would require “solidarity and mobilising efforts of all countries of the world”, echoing earlier similar calls. He also mentioned Islamic institutions Al-Azhar and Dar Al-Ifta’s role in combating extremism by “confronting extremist thought and Islamophobia through a moderate religious discourse”. This is a discourse though that seems to be based on the monopoly of Al-Azhar. Mehleb promised to evaluate the options of raising the number of scholarships for Indonesian students at Al-Azhar, and to improve their working conditions there. The conference initially started out as a fight against the influences of colonialism and opposing imperialism. Indonesian President Joko Widodo commemorated the conference by claiming that back then “we [the participants] declared the Asian African solidarity in our fight for independence, prosperity and justice for our peoples”.